Front row - Alex Duthart, Hugh MacKenzie, Ian Angus, David Boyle, Jock MacDonald, Drum Major Sandy Macpherson, Hugh Chisholm, Bobby Macrae. Tom Anderson, John Ross and Bob Leitch. The Cowal Shield was for World Drumming Championship. The Drum Major's Mace (World Championship) was presented by Sir Max Rayne. I think the missing name may be John Wood - he's an Invergordon lad who served his apprenticeship as a plumber in the distillery. I know he was learning to play the big drum and did play in the band on a few occasions. He can be also seen in picture #391 and picture #820. I think the man with the big drum is my father, John Milton, who was killed early in 1967. I know he played with all these other people and he was in the band when they were world champs. The missing name is definitely John Wood and the info supplied by Dave Smith is accurate. John Milton had passed away before this photograph was taken. At last, information of Invergordon Distillery Pipe Band - my Best Pipe Band on the world!!! I was wondering why nobody writing about this famous people who played in this Band with pictures. I'm playing also bagpipe for 30 years and so far I can see Sheila Burgess give us also information howabout it was in that time, (maybe more for later?). I'm thinking there must be more about this Invergordon Pipe Band!!! Maybe also film? The persons in this Band about: John Burgess, John MacDougall, Donald Shaw Ramsay and other famous players. Write something about them, also for the young people in this time. We can't forget this Band for later!!! I was brought up with that pipe band, my dad is Bobby Macrae. They were probably the best band never to be world champions beaten by a quarter of a point. As far as I'm aware, the only time the band appeared on film was in the David Niven version of Casino Royale... I think they were one of the bands involved in getting mown down in hail of machine gun fire by Ursula Andress. The other bands were Muirhead & Sons Ltd, Shotts & Dykehead, Edinburgh Police, Glasgow Police...Bizarre, but true. I remember hearing some stories about the filming of Casino Royale as John mentioned, most of them unrepeatable. The one that sticks out is Peter Sellar's then girlfriend Britt Ekland being a spoilt brat on the set and carrying one of those toy dogs about all the time. I think the band spent three days in London filming for the sake of less than a minute on screen. Yes they were in the original Casino Royale film. I still have the autographs of Peter Sellers and Ursula Andress that my father (John Milton) got. Best Graham Macrae, can you tell me about your dad Bobby Macrae how it was to play in this band? Maybe you have any photos of the band or from your dad? Nice to read your comments on your dad Graham; did you know my old fella was in the band too? Played the Bass Drum, and went to Canada with them round about '72/'73. Maybe you will have a more accurate date? My dad, Tom Mackay was a drummer in this band and played with Jimmy Hutton, Bert Barr and Alex Duthart. All of my childhood was filled with wonderful memories of the pipe bands; I would love to hear from anyone who may have played with my dad. Does anyone know where I can get the band music on CD or LP, I would be most grateful? June, is your Dad Dodie Ross from Tain? My grandad was Kit Reynolds who passed away in 2009. He loved being in the great Invergordon band. 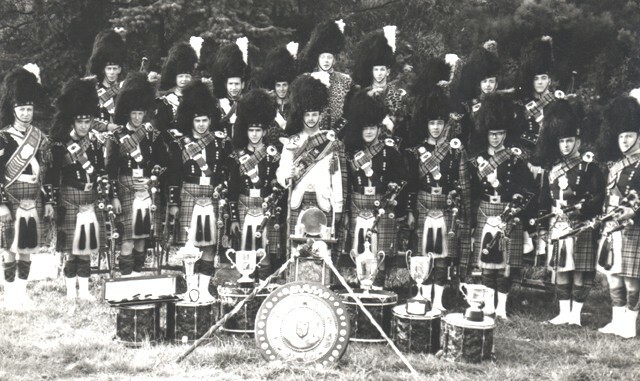 I think the piper on the extreme right front row is Trevor Dear ex Forfar Burgh Pipe Band PM. Became Pipe Sergeant in the above band. PM Dingwall B L Pipe Band and circuit piping judge. Sandy Macpherson was the best drum major in the world. Piper on extreme right front row is my late father-in-law, Bob Leitch, not Trevor Dear, as Bill Johnston suggested. Does Invergordon have a band today? Not Trevor dear, as suggested. Was looking at casino royale 1967 tonight. Was best band in history. Invergordon distillery pipe band will never be equalled. Sandy MacPherson actually won the worlds, as well as cowal, British, and European. God bless all now gone.